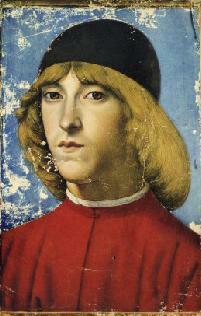 This is a portrait of Lorenzo de' Medici's son, Piero, who took over the family interests after Lorenzo died. 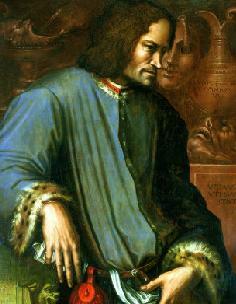 Piero was nicknamed Lo Sfortunato, the unfortunate one, because of his poor health and the troubles that faced the family interests in Florence, resulting in their banishment and their properties in Florence being looted. The U. S. Library of Congress, together with the Vatican Library, have an online guide to an exhibit on Rome and Humanism during the Italian Renaissance. They show you pages from the original texts, many of which are mentioned in this book. They cover various subjects from the era. There are lots of theories out there concerning many of Botticelli's paintings, and there are very interesting ones in Ms. Proud's books. 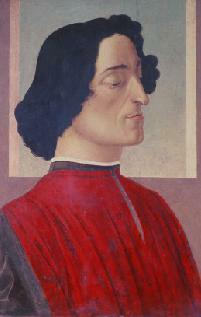 Botticelli left behind not just beautiful paintings, but puzzles for all to enjoy. The rebellion of Volterra during Lorenzo de' Medici's time, as described by Machiavelli in his History of Florence. Go to the mid-point of the chapter in this link to find the part about Volterra. Pazzi Conspiracy, as described by Machiavelli in his History of Florence. Leonardo da Vinci A Tabernacle for the Sun, by Linda Proud, is a historical novel set in 1472-1478, the time of Lorenzo de' Medici, and takes place in Volterra, Rome and Florence, Italy. It is a trade paperback, of 490 pages, divided into 5 'books', representing 5 phases of the fictional narrator's early life, Tommaso de' Maffei. Historical novels have an appeal over history books, because they bring dry history to life through characters who speak directly to us and allow us to enter their hearts and heads. The historical novel allows us to be a fly-on-the-wall during fascinating moments in times long past. Ms. Proud's novel does this through her fictional, first-person narrator, Tommaso de' Maffei, who grows from child to young man in the course of this novel, and we follow him along through his adventures. 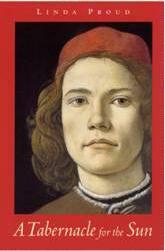 The book cover features one of Botticelli's Portrait of a Young Man painting. It appears to be the physical inspiration for the fictional Tommaso character. 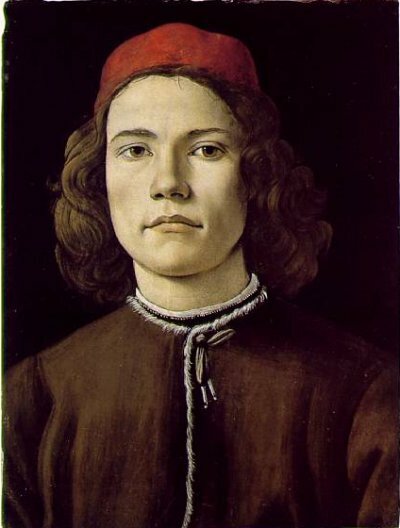 Most of the other major characters in the book are based on real people from the Italian Renaissance, and the author stays very close to history in their depiction and the description of events. To be honest, while reading the book, I couldn't help thinking of Forrest Gump, the fictional book/film character who was inserted into many of the key moments of U.S. popular culture from the past few decades. In the same way, Tommaso de' Maffei is present at many of the key moments of de' Medici history. But Tommaso sees and speaks with the knowledge of a mature man looking back on his life, as he writes his story in 1500 for his fellow humanist-intellectual, Erasmus of Rotterdam. This narrative device creates another layer of interest for the history-loving reader. The seeds of humanist, neo-Platonic study planted in Florence during the early years of the de' Medici influence, blossomed in later years, and eventually became a threat to the Catholic church. Through Tommaso, we get a glance at the origins of the New Learning as well as where that New Learning lead. Ms. Proud is a fluid writer who has a highly developed skill of putting herself in her character's shoes. Her detailed descriptions of life in Volterra, Florence and Rome make you wonder if perhaps she didn't live there in a previous life in years gone by. I especially enjoyed her descriptions when Tommaso, a young boy who has known only life in the rustic hill town of Volterra, goes to Florence for the first time. Through her narrator, but with her own reflective and intuitive perspective, Ms. Proud paints a picture of Florence that the reader will never forget. "It makes your buttocks ache walking on flat ground all the time." And later, when his calves hurt after a short run up a hill in Florence, Tommaso reflects that he has adapted more than he realized to life in Florence, and not just physically. Even if you have been to Volterra and Florence and toured all there is to see (which is a difficult feat), you will find yourself seeing the towns with a new perspective, thanks to Ms. Proud's highly reflective views on churches, artworks, houses and even streets. The author is also clearly a student of music, which adds another dimension to her description of Renaissance life. Music was part of the New Learning. Music was a part of art, architecture, design, education and mathematics. Ms. Proud manages to integrate music into learning in a way that one wishes were done today. It might inspire more students! Ms. Proud is English, but understands very well Italy, Italians and the regional characteristics that distinguish Italy even today. The most amusing passages in her book, in my view, were when she represented an Italian's view of England in 1500, such as this passage. "We have a phrase in Italian: fare belle figura. Some would say that to cut a fine figure is more important to an Italian than anything else in the universe, save perhaps avoiding damnation. It is possibly true. I notice, for instance, that the English spend more on their furniture than on their clothes, which is why I would rather be in one of the houses than out in their company." And she tackles kisses, food and the weather, too. The author shows a strong grasp of the history and the personalities of the period but assumes, perhaps generously, that her readers share her vast knowledge. The novel puts the reader in the period and guides the reader through interesting times and challenging ideas. But the story, as told by Tommaso de' Maffei, is suitable for young adult readers as well as adult readers. A Tabernacle for the Sun is a wonderful book for those who wish to learn more about the fascinating time of the Italian Renaissance, and for those who wish their knowledge of that time to be placed in a novel setting, bringing it to life. If you know the history, don't expect surprises, but do expect to see it through new eyes. Ms. Proud continues the story with two books that together with A Tabernacle for the Sun make up her Botticelli Trilogy, described below. Tabernacle of the Sun is divided into 5 Books, each describing a phase in young Tommaso de' Maffei's life. If you'd like to know generally what those phases are, read on. If not, skip down to read about the two sequel books by the author. This trilogy by historian/novelist Linda Proud is a real accomplishment. She manages to bring to life Lorenzo de' Medici's Italy through characters key to the Italian Renaissance, but never loses sight of the human aspect of that time of clashing ideas from the Medieval and from the rebirth of classic knowledge and philosophy. I link to her publisher's site, Godstow Press, where you can read about the books and enjoy excerpts from the three novels. You can purchase the books via Amazon.uk. A Tabernacle for the Sun is told by Tommaso de' Maffei, whose story involves the Pazzi Conspiracy against the de' Medici, and many thinkers and artists of the time including Marsilio Ficino, Angelo Poliziano, Lorenzo de' Medici, Botticelli and Filipino Lippi. Excerpt. 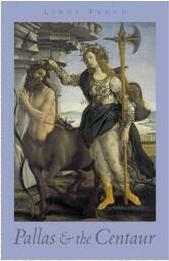 Pallas and the Centaur takes up where the first book leaves off and is told by Angelo Poliziano, poet and intellectual. The Pazzi Wars follow the assassination attempt on the de' Medici, which took the life of Lorenzo's brother, Giuliano. But there is a war of ideas that is just as heated, between superstitious Medieval, God and church centered Europe, and the new Europe of the rational, man-centered neo-Platonists. Excerpt. 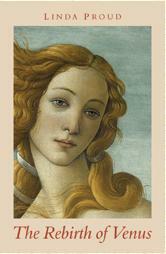 The Rebirth of Venus is a chronicle by Tommaso de' Maffei written for Erasmus, whom he will accompany to Florence. 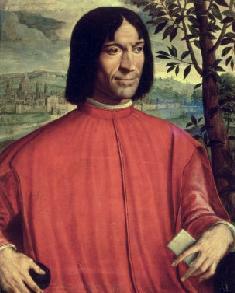 It details Tommaso's life in Florence under Lorenzo de' Medici's rule, after the Pazzi Wars are over. Tommaso becomes a printer and eventually moves to Venice, then to London. He is in exile because be became too closely involved with the charismatic, religious extremist Savonarola. Excerpt (pdf). Visit Ms. Proud's website for some itineraries to consult before your next visit to Florence. And there is an entry at Wikipedia about her, too. 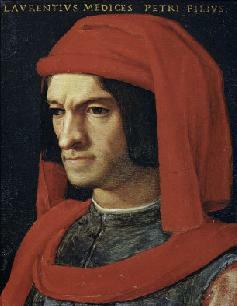 For a brief history of the De' Medici dynasty, visit my Medici pages. You can purchase the books via Godstow Press or via Amazon.uk.